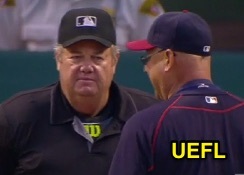 HP Umpire Joe West ejected Indians Manager Terry Francona for arguing a check swing (strike three) call by 3B Umpire Mark Ripperger in the bottom of the 9th inning of the Marlins-Indians game. With none out and two on (R1, R2), Indians batter Jason Kipnis attempted to check his swing on a 0-2 changeup from Marlins pitcher Fernando Rodney. Ruling was reviewed and affirmed by the UEFL Appeals Board (8-0-1), the call was correct. At the time of the ejection, the Marlins were leading, 5-3. The Indians ultimately won the contest, 6-5. This is Joe West (22)'s fourth ejection of the 2016 MLB regular season. Joe West now has 8 points in UEFL Standings (5 Previous + 2 MLB + 1 Correct Call-Crewmate = 8). Crew Chief Joe West now has 7 points in Crew Division (6 Previous + 1 Correct Call = 7). This is the 152nd ejection report of the 2016 regular season. This is the 60th Manager ejection of 2016. This is Cleveland's 6th ejection of 2016, T-3rd in the AL Central (DET 10; CWS 7; CLE, MIN 6; KC 5). This is Terry Francona's 3rd ejection of 2016, 1st since August 3 (Fieldin Culbreth; QOC = N [Replay]). This is Joe West's first ejection since July 26, 2016 (Angel Pagan; QOC = N [Balls/Strikes]). Wrap: Miami Marlins vs. Cleveland Indians, 9/4/16 | Video available via "Read more"